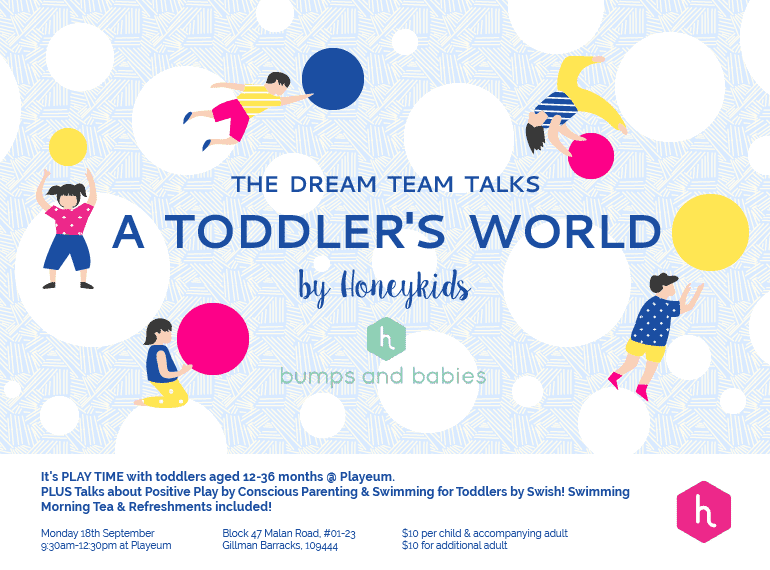 Introducing, The Dream Team Talks: A Toddler’s World! So far our Dream Team journey has taken us from pregnancy to infancy, and now things are getting really interesting as we enter the world of toddlerhood. Brace yourselves, parents. We’re inviting parents with kids aged 12-36 months for some play time at Playeum where you and your toddler can have some fun together while hearing from our experienced guest speakers. They’ll cover topics such as positive play, and swimming safety for toddlers. And of course, we’ll feed you (well, we’ll try. There’s a toddler by your side, after all). Ticket price: $10 per child with accompanying adult ($10 for additional adult). Tickets are only available here. Check out our editorial for more exciting details here!